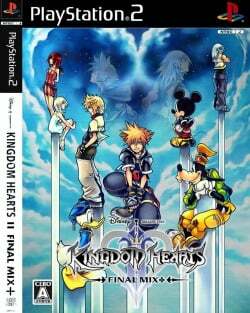 Game description: Kingdom Hearts II Final Mix improvements over the original, Kingdom Hearts II, include an English voice cast, tweaks in all difficulty modes and a new "Serious Mode" difficulty, new areas and redesigned navigation maps, new scenes from the Japanese Manga, new boss battles against the mysterious Organization XIII, one of the fights that was a cut-scene in the original is now playable, and all censored parts of the game are no longer censored. Description: Sunlight is seen coming through walls. Workaround: Set MSAA to 0x in HW Hacks in the GSdx settings. Description: On launching the game PCSX2 will show a black screen for 5 minutes or so while trying to scan layer 1 of the iso. After this time you are brought to the main menu and the game can be played normally. Workaround: Making a save state on the main menu seems to reduce the load time to under 10 seconds. with or without loading from the save state that was created. This page was last edited on 16 April 2019, at 08:31.